Our academic calendar is similar to Sturgeon Bay school’s calendar. We have a Running Club for students in Kindergarten through 8th grade. It cost $7,100 to educate a child at St. John Bosco Catholic School. There were originally three Catholic schools in Sturgeon Bay: Corpus Christi, St. Joseph, and S.S. Peter & Paul. Save The Date… Our 5th thru 8th graders will be performing The Little Mermaid Jr. April 25th @ 3:30 p.m., April 26th @ 7:00p.m., and April 27th @ 2:00 p.m.
We now have St. John Bosco car decals! Car decals are available in the school office. A $1 donation would be appreciated. Help spread the word on what a great school SJB is! 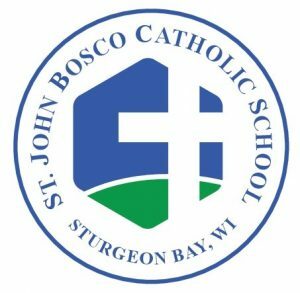 St. John Bosco Catholic School is shaping future leaders by providing academic excellence in a caring 4K-8 environment where God’s gifts are nurtured and where faith is put into action. Thanks to FLS we can now order St. John Bosco spirit wear online. Click the website below to place your order. Spirit Wear. Spirit Wear store will close April 21st. Get your orders in now! Steve Beylon from ACTION 2 NEWS came to our school to teach the 1st and 2nd Grade about the weather! Our students love the hands on experience they get with Project Lead The Way!